I shared the before-and-after of my master bedroom closet last year, but I have added some features that I wanted to share with you. 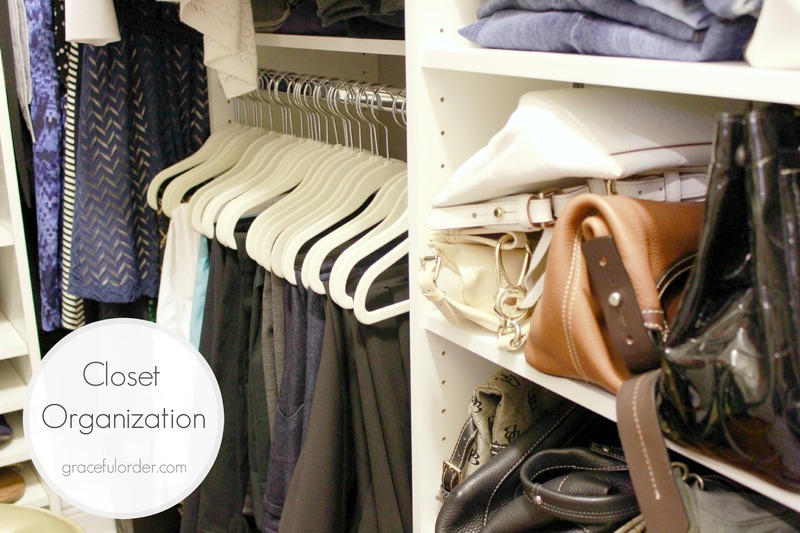 You can transform your closet by learning how to best use the space you have. Organizing your closet will also simplify your morning routine. I am a stay-at-home mom, and I am not very adventurous with my wardrobe. I basically wear jeans and a t-shirt everyday (not the same one!) with minimal accessories, except for the weekend when I put forth more effort. I like dressing down and I like dressing up. When I do dress up, I like options! I like my closet to look like a mini-boutique. Because I am girlie, I am just not fussy. Start by sorting your pieces. Sort your items and get rid of things that you know you will never wear again. Items, even expensive, good quality ones get faded, they pill, they eventually look dated. Donate them or toss them if they are in bad shape. That way you can make room in your closet for the items that you wear and love. There is no sense in having a crowded closet, when you can get rid of items that you don’t like or use. Having space between your clothing even makes putting away laundry easier. Display your favorite pieces. Most of my jewelry is costume jewelry and I have a lot of it. I have a stand alone jewelry armoire in my bedroom, but nothing compares to actually seeing my options when I am getting dolled-up. One of my favorite buys is this jewelry display . I find that I use my bracelets and watches so much more after I added it to my closet, and doesn’t it look like a store display? Love that. I added an earring display (I do wish it had more room though). And a ring display , actually I bought two. These are all faux pieces. If they weren’t, I would be blogging from my private jet. I would still be blogging though…I love it that much! 3. Add a garment valet rod . This one fit right into the pre-drilled holes in my closet system, so that I can put outfits together (when I take the time to do that) or even when I am putting away laundry, and I just want to get shirts on a hanger before the wrinkles set in. It tucks right in, when not in use. 4. Color-code your wardrobe….Game Changer! This takes a while the first time you do it, but you will save so much time when you are getting dressed. Also, putting away laundry is faster when you know where everything belongs. 5. 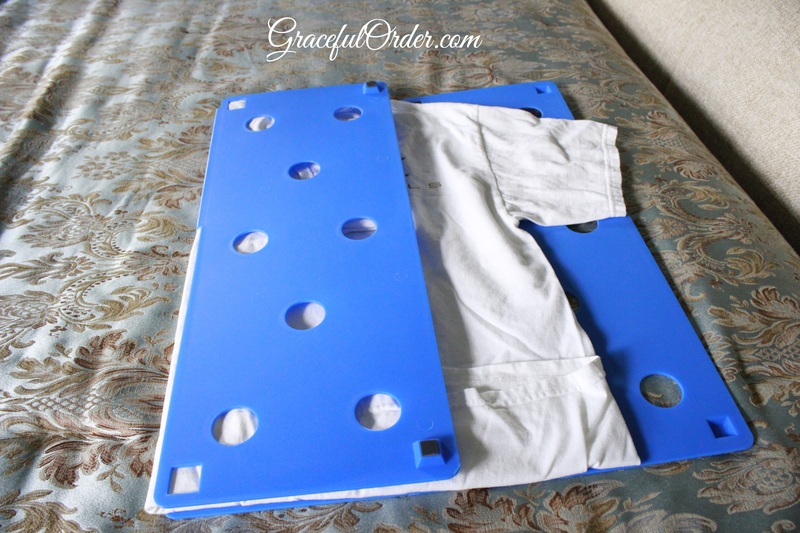 Laundry Folding Board for perfectly folded shirts. Honestly, I don’t use this board for my clothing since I hang up most items. I do use a laundry folding board for my husband, because he has so many t-shirts. It keeps all his shirts looking great in his closet. If you fold your shirts, it’s a must for the department-store-perfect-fold look. I found mine in The Container Store but I couldn’t find it there now, so here is a similar folding board on Amazon. 6. Invest in thin hangers (whether plastic or flocked). This will give you so much more room! Wood hangers are beautiful and they are great for suits, but they are also bulky. 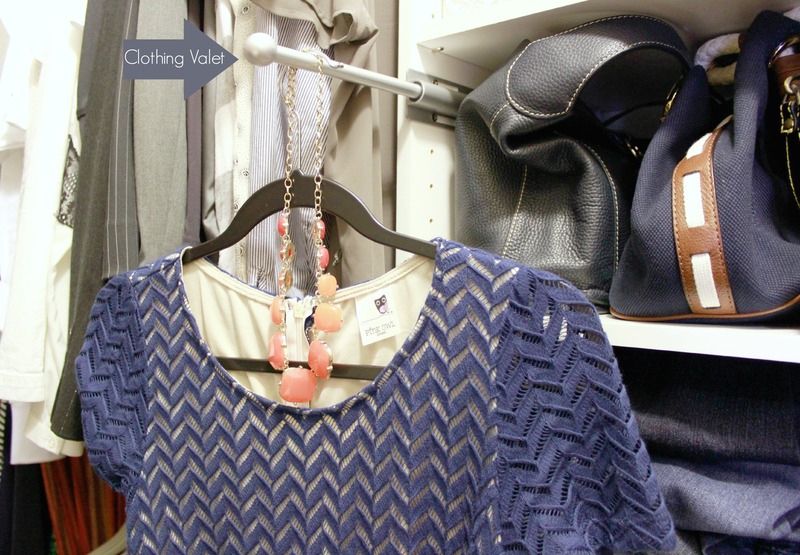 If you are looking to make space, thin hangers are the way to go. 7. 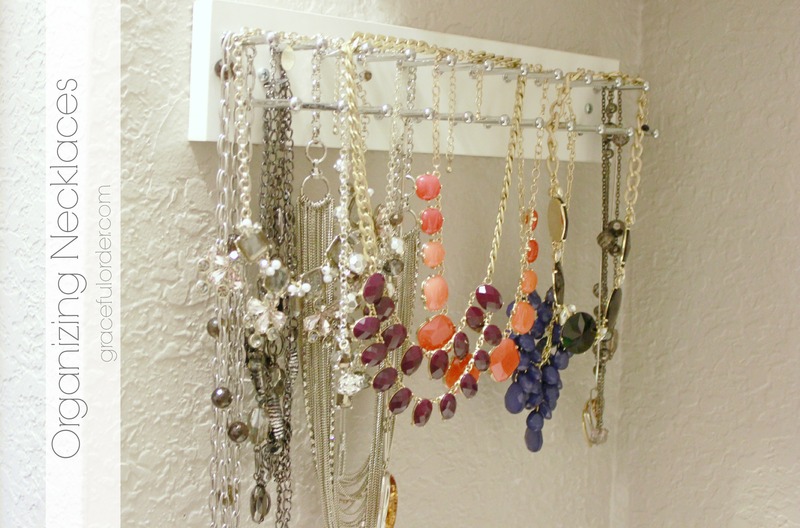 Use a tie rack to display necklaces. Bulky necklaces are really fashionable right now and tie racks are perfect for holding larger jewelry pieces. It also keeps them from getting tangled. 8. Bring a dresser into your closet. When I shared about our master bedroom, I mentioned that we opted for a sitting area as opposed to a dresser. Adding a small dresser inside the closet definitely made up for the storage we lost in the bedroom. This dresser is from IKEA and it is topped with glass (sold separately at IKEA) so I don’t have to worry about it getting scratched. Plus, I think it looks nicer with the glass topper. The rest of the cabinetry was built around that dresser. 9. Add a mirror to your closet. I could have added more cabinetry above the dresser, but I am so glad that I didn’t. Even a small mirror can make your closet look larger. I didn’t have space for a full-length mirror, but even this little one did the trick. I can also try on my accessories in the closet, which wasn’t possible before. 10. Use kid hangers for your pants to save space. I used to use regular sized hangers for my pants, and they would take up so much space. One day I tried using hangers from my son’s closet and they were a perfect fit! I bought a couple of sets for myself. I will be honest, I am not a fan of felt hangers. I don’t like how they cling to clothes (which I get, is the point) but for pants I did prefer the felt, it keeps the pants from sliding. 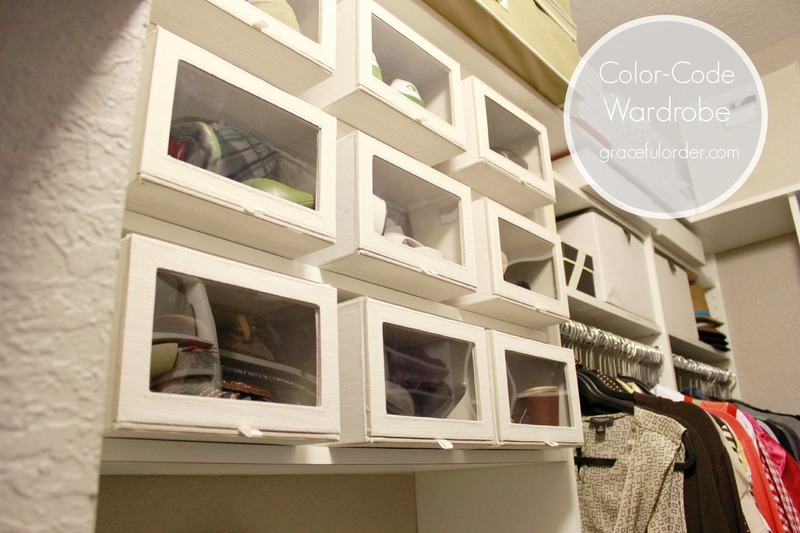 These are my favorite tips and products for transforming a closet! The key in organizing your closet is to capitalize on using all the space available, but the key to transforming it, involves a little bling. I hope you all enjoyed this tour of my closet and I would love to hear from you. 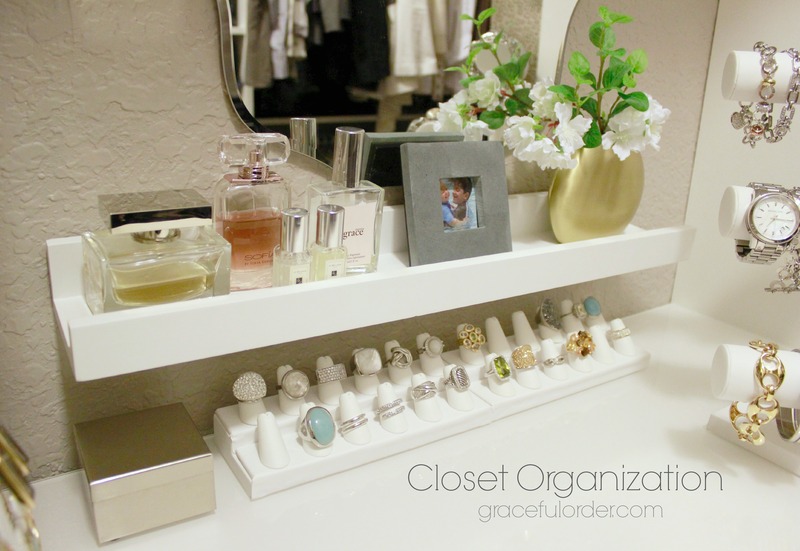 What are your favorite closet organizing tips? 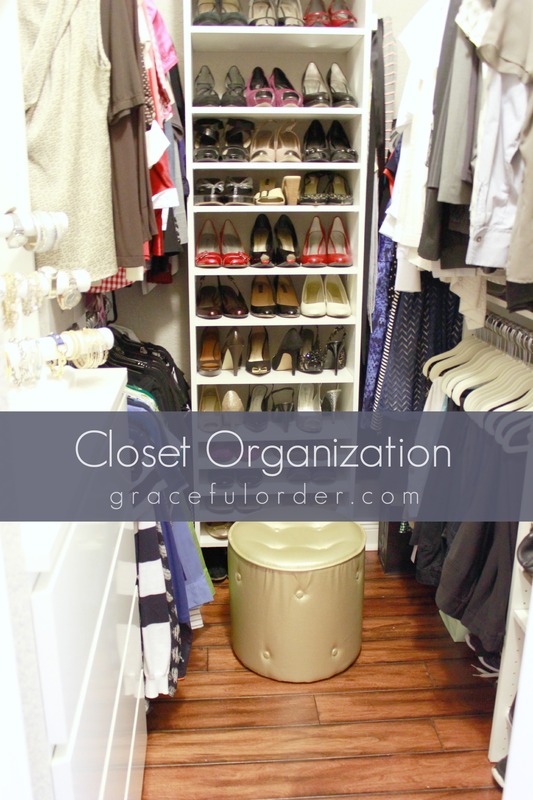 My favorite tip is keep your closet clutter free – purge, purge, purge. I’m moving soon and my new closet will be teeny tiny, but I love your dresser with mirror and displays. I might have to extend my closet and make a beautiful corner or something. I agree, purging is key! I think having a pretty corner is worth it, no matter the size of the closet. My last closet was smaller and all I did was add a little plant and a picture frame on a small shelf, it still looked pretty. I love your thoughts in organizing a somewhat small closet. My closet size is similar to yours. I have the old ugly looking racks even though, I do have it organized it’s just plain ugly and too full. I would like to know where did you purchase the cabinetry? You gave me a great idea on tearing down those ugly racks and making my closet look feasible and cute! Looking forward to more of your great ideas!! Thank you Janet! The small dresser is from IKEA but the cabinetry around it was not a store or brand “closet system”. We had a local company build the closet, since none of the other systems fit the dimensions we needed, especially after adding the dresser. 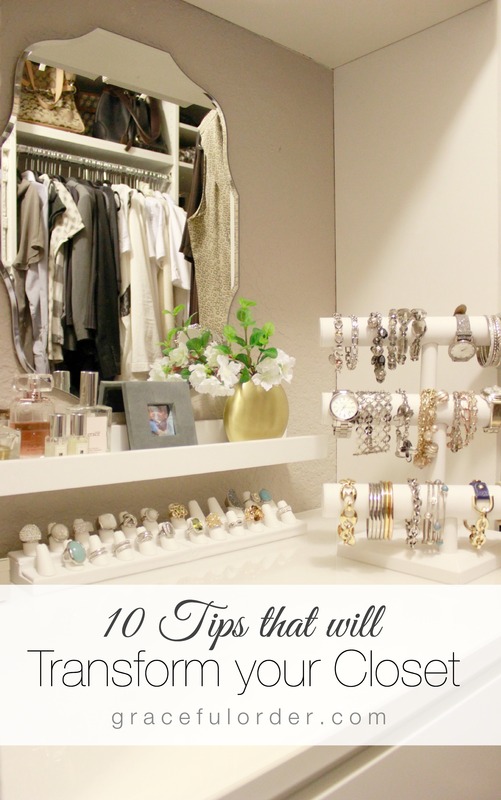 I’m sure your closet will look great when you are done with it! Tie rack for necklaces? Winner! Especially for the chunky necklaces! 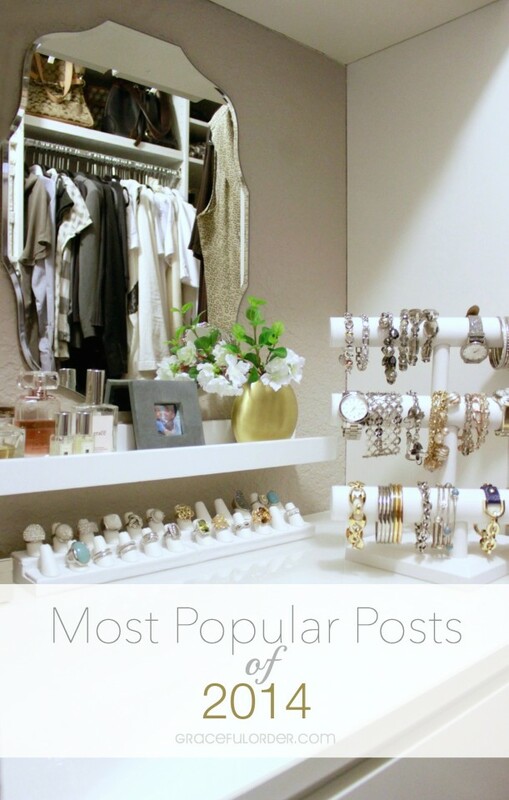 I added similar spot in my closet for displaying my jewelry and have LOVED it! It has stayed neat and organized for over a month! 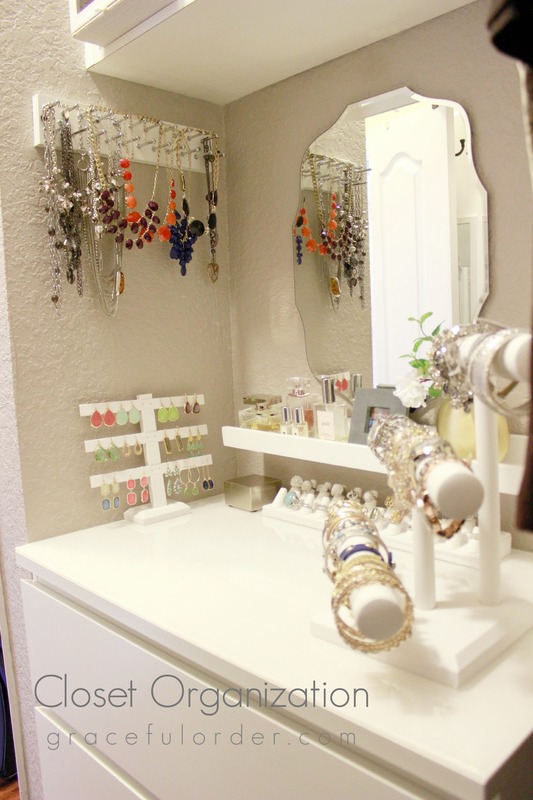 You have such a beautiful closet, I love the little nook you created for your accessories! Where did you find that mirror? I love the shape and the fact that it’s not bulky! Thank you Nadia! I bought the mirror at Target. I love all these idea. Where did you find the mirror and the small shelf below that holds your perfume? The mirror is from Target and the small shelf is from Pottery Barn. The shelf was meant to be used as a ledge that holds picture frames. It was a set of three and I used one of them for my perfumes. 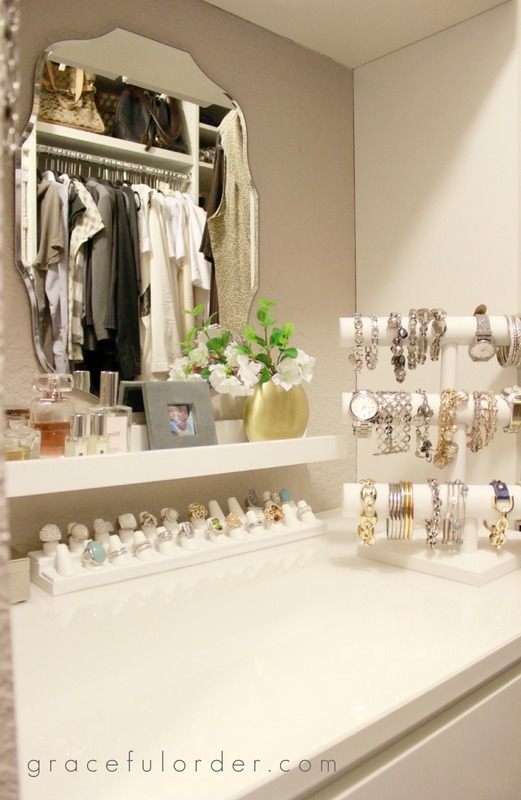 Your closet is absolute perfection! I also swear by color coding…so worth it! I also like to have an ottoman to sit on, but that opens so I can store larger purses or even some boots in it. 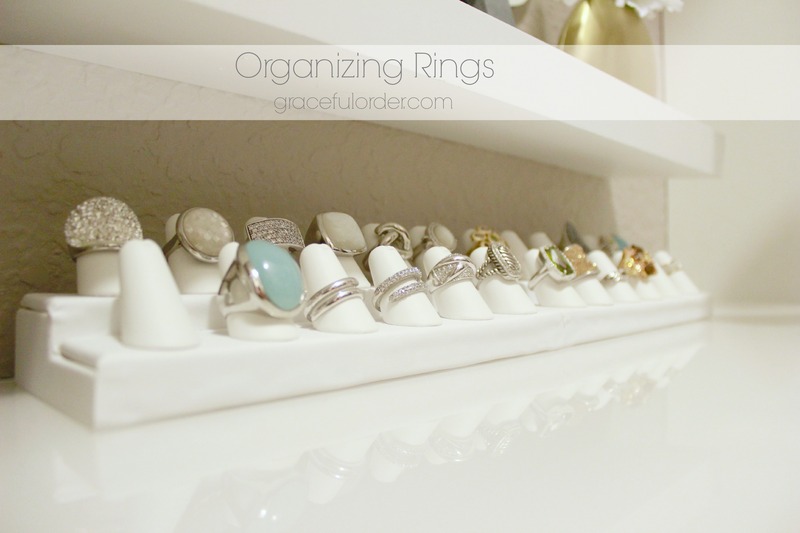 We are moving into our new home in 2 weeks and I’ve been looking for ideas on how to organize my jewelry in my closet. This post was so helpful…thanks for sharing!! So glad you liked it! Congrats on your new home! Ion I have so many ideas now for my closet!! may have missed it, but where did you purchase the boxes on your shelf? The ones with the clear fronts in the picture that says Color Code Wardrobe. Wonderful ideas Janet!! Thank you! Those boxes are from Target. Love the kid sized hanger idea! Great job making a pretty and functional space! Thank you! The kid sized hangers for pants is one of my favorite tips! Beautiful closet! I would love to display my necklaces like that – but do you find they tarnish being exposed to air like that? I keep mine in an enclosed case. I’ve had trouble in the past with my jewelry all tarnishing thanks! Thank you Della! I do keep my silver jewelry in a pouch that preserves them, but a lot of my pieces are stainless steel and I have never had them tarnish. As far as the colorful chunky necklaces, most of them are inexpensive and they do tend to tarnish after a while, regardless of where I store them. I love your closet!! Thank you for the great ideas. I live in NY so space is not an option so I’m always looking for ways to optimize what tiny space is available. My biggest issue is SHOES. Where did you buy or how did you make your shoe shelves? Any suggestions on that? I have 100+. Thank you! I had a closet company come out and create a design that would fit lots of shoes. However, it was still not enough for all my shoes so I had to get ruthless and get rid of the ones that I wasn’t crazy about. :-/ Before I had the closet built-out, I would purchase inexpensive shelves and secure them together to place my shoes and sweaters. The shelving unit for hanging my clothing used to be a white wire system, so my husband added another row of wire shelving close to the closet ceiling so that I could store items that were not frequently used (maybe you could use that for shoes that are seldom worn). I used every inch of that closet! In my current closet system, I have my frequently used shoes displayed (like you see them in the picture) and the shoes that I seldom wear are in fabric boxes above the white dresser (see the picture that says “color-code wardrobe”). Hope that helps! Hi Maria, I love all your ideas. I tried looking for your little dresser on the Ikea website but couldn’t find it. Do you by any chance remember the name of it? Did you find the glass topper near the dresser section at Ikea? Thank you for your time. Thank you, Susan! The IKEA dresser is from the MALM furniture line. The dimensions are 31 1/2 x 39 3/8″. Also, the glass topper was downstairs in my IKEA store, although the dresser was upstairs with the rest of the furniture. Although separate items, the topper was was meant specifically for this piece because the measurements were exact. Hope that helps! This is perfection! 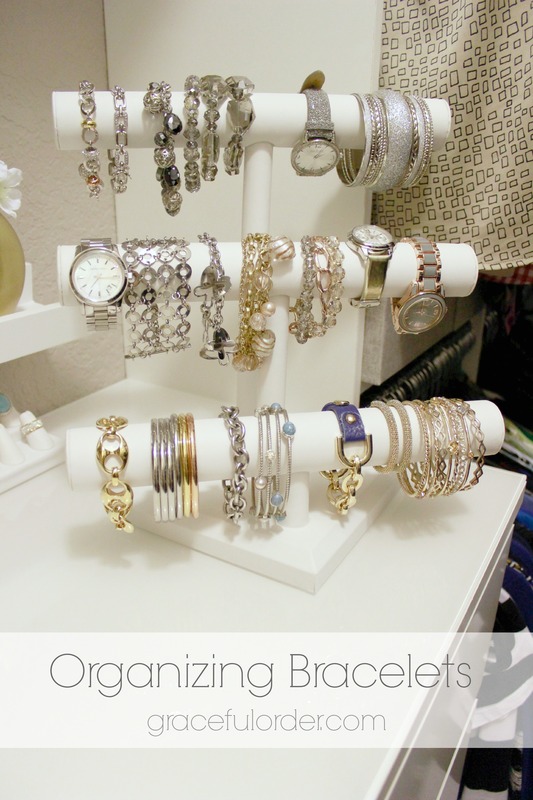 Your jewelry display is exactly what I have been looking for. Thanks for the great idea! Glad you liked it! Thank you for your comment! LOVE the shape of the mirror on top of your dresser! Where did you get it from?! Thank you! The mirror is from Target. Awesome tips! My fiancee and I are doing a huge master closet and this was very helpful :)! LOVE this post! We recently purchased our first home together- it’s small but so beautiful. 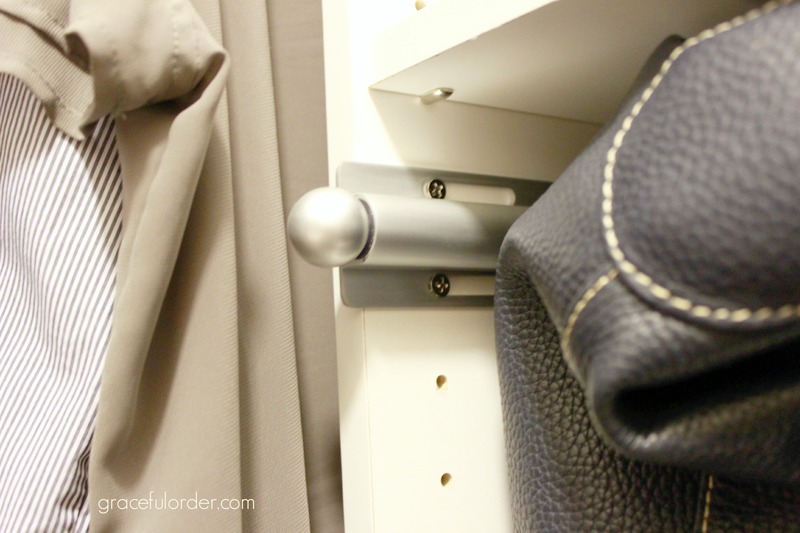 I am a closet organization freak, so the custom closet organizers already installed are a huge plus, but I still need inspiration on how to make the best of the small space. While our house is only 985 sq feet, it’s beautifully remodeled and has a gigantic backyard near the beach… something very hard to find in San Clemente, CA! 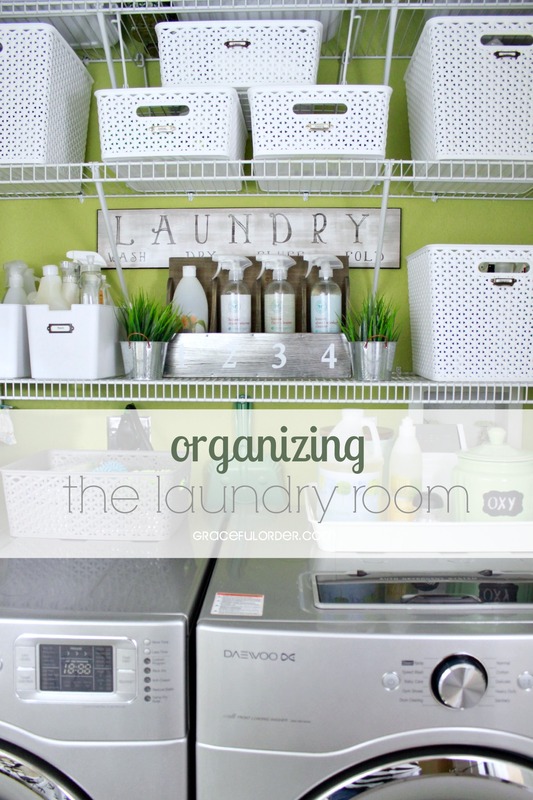 Thanks to blogs like yours, I can utilize every square inch of my small spaces perfectly. Thanks again! Congrats on your new home Chelsie! Thank you so much for your comment. Our first home was only slightly larger than yours and I had so much fun decorating it. When we sold it years later (although upgrading to a larger space) I missed it so much! I am sure that your home will turn out beautiful! Beautiful closet! I’d love to know the brand of your earrings- many seem to be the same brand? Thank you, Annie! Most of those teardrop earrings are from Target. I have to say that as cute as they are, they tarnish easily so I have stopped buying them. I have found similar styles on Etsy that are still affordable, durable and with real stones. 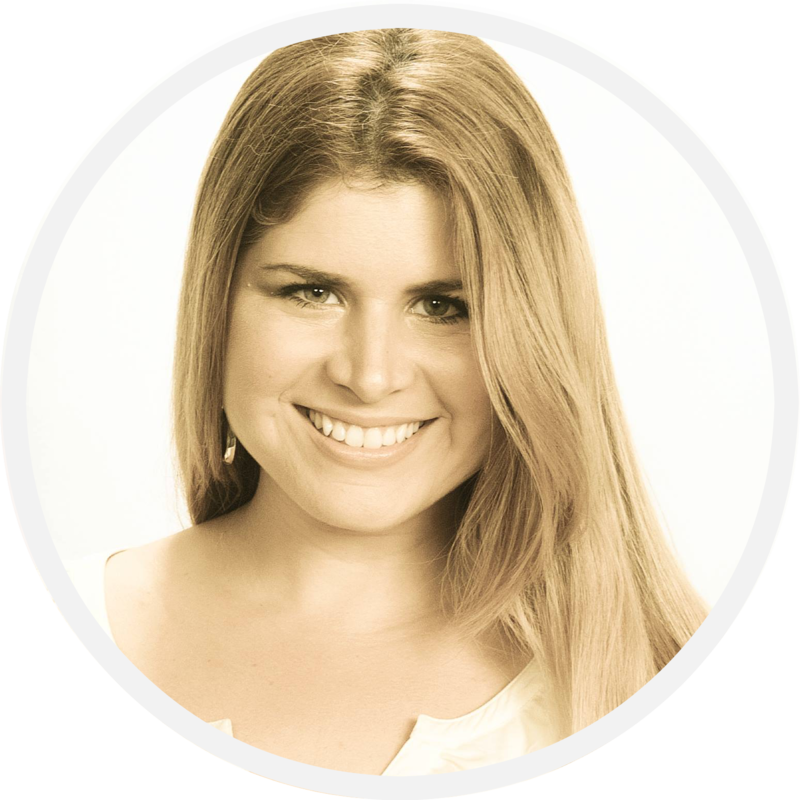 Hi Maria, I love your closet ideas! How do you store shorts and skirts? Thanks! Thank you Sherry! I fold my shorts and store them in the dresser that is inside my closet. I hang the skirts alongside the pants, but I only have a few. Maria, this is a beautifully designed closet!! It’s the EXACT size and shape of my closet in our new home. Is it possible to take a picture of the whole closet, or each side? I’d love to see how it looks all together. 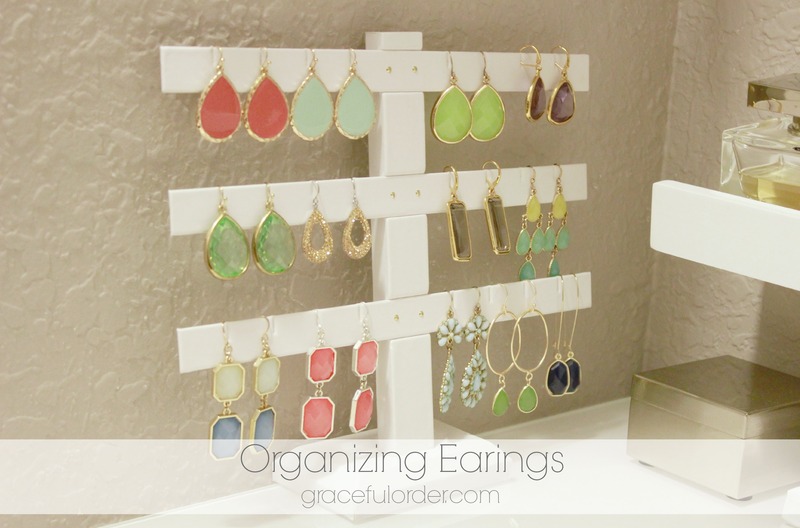 Your storage ideas and jewelry display are pure genius, I love everything about it! Olivia, stay tuned because I will be sharing detailed pictures of my closet this month on the new organizing series. If you haven’t already, sign up for the email updates (on the sidebar) so that you don’t miss it, or check back often. Thank you so much for your comment! Maria, do you remember where the little white shelf under the mirror, that holds your perfume, picture frame & vase is was from? Hi Evelyn, It’s actually a ledge for a picture frame. Sometimes at Target you can find picture frame sets that bring a wood ledge in the box.